and once I had it cut short I started to straighten it with my ghd's every day. However, once I dyed it blonde and started growing it long again I realised I needed to hold back on the heat tools if I wanted to keep it in good condition, so I invested in the John Frieda 3 day straight spray and the fact I now only straighten my hair after washing it and let my hair go ghd free in the one or two day gap inbetween is testament to how good this product is! 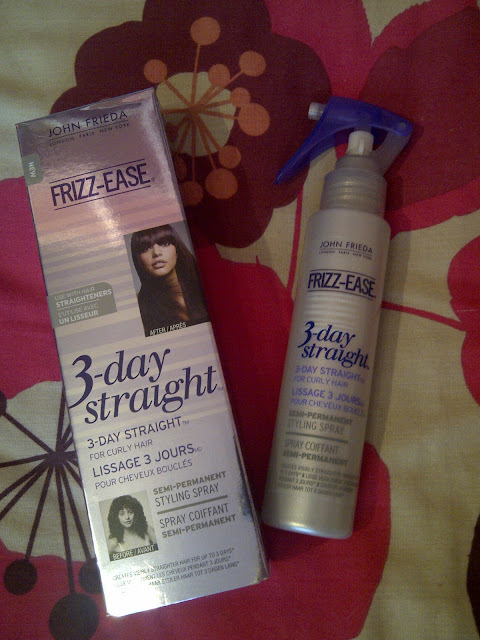 'John Frieda Frizz Ease Spray transforms curly, frizzy hair into a straight, smooth style that lasts up to 3 days. 'Spray throughout damp or wet hair, NOT on dry hair. Start with 10-15 sprays. Use more or less, depending on hair length and thickness. So firstly, yes I do think this keeps your hair straighter for longer, obviously it doesn't always keep it perfectly poker straight or totally protected from the weather, but the most I ever have to do in-between washes now is touch up places where I've slept on it funny or where it's been blown about or rained on! It also seems to make my hair less frizzy and more manageable after blow drying so the straightening is easier anyway. I'd definitely agree the spray is weightless too, as it doesn't leave my hair feeling sticky or heavy and the feeling that you have product in your hair seems to go when you straighten it. I feel like it's hard to tell how well it protects your hair from heat, but considering how much my hair has been exposed to heat over the years it's in pretty good condition, so I think that shows the protection works. As for making hair 'glossy, smooth and swinging with body' I feel like it would depend on your hair type, as I don't have fine glossy silky smooth hair naturally so it would be quite amazing if it changed my hair type completely, but I do think it gives my naturally frizzy hair a nice smooth finish, although I'm pretty sure the volume I have comes from hair spray! So overall I'm very happy to give this product a secure place in my hair care routine as it lives up to its main claims, can be used in conjunction with other products (such as smoothing serums or oils) and comes in at a very affordable £6.99 (plus it's usually on some sort of offer in Boots anyway!). You don't get the biggest bottle ever at 100ml, but a few sprays covers my whole head so I find one bottle does last a really long time. Have you tried this product? Or have you got any other tips to keep me away from the ghd's? I'm just having a pretty relaxing day off from uni today, then I'm making a belated birthday dinner for my friend Joe later tonight so I need to go on the hunt for some recipes now! Meg I LOVE this product, I have long, wavy and extremely thick/frizzy hair and this has worked wonders for my hair! I use it after every wash then straightne with my GHDs and my hair stays so straight.